Entering the Lawn for the first time, whether today, 100 years ago, or back in the 1820s when it was new, you’re overcome with the same sense of awe: Where have I set foot? What is this magical place? Simply, wow. Then as now, the Lawn inspires; indeed, it overwhelms. Rows of columns of various sizes stretch out, making different rhythmic patterns that surround the grassy expanse. The trees and their branches, whether in spring, summer, fall or winter, interact with the buildings. As you walk down or up the Lawn, buildings of different sizes appear, called to order by a great dominating domed structure at the northern end. Behind the buildings lining the central Lawn, one encounters curving walls that create a very different type of space—the intimacy of the gardens. Then, beyond the gardens, the visitor encounters the Ranges and Hotels, with their curved arches or arcades, an altogether different experience. 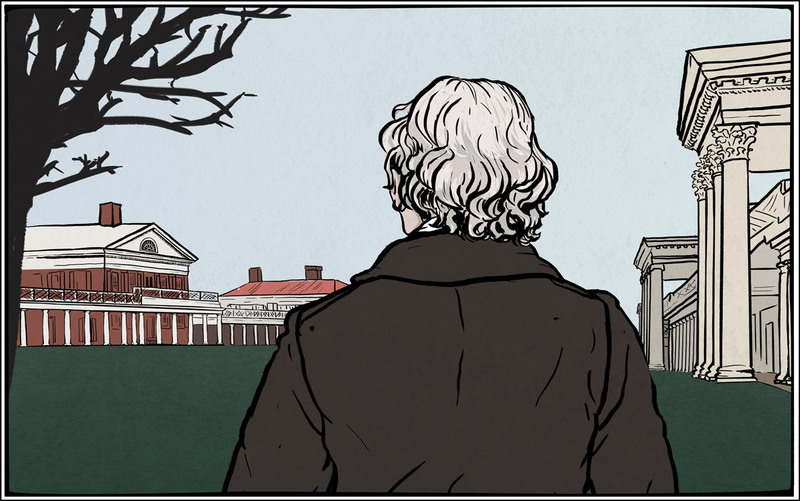 Thomas Jefferson had many goals for the University he created, both intellectually and physically. One of the central themes concerned learning, experienced not just in the classroom but more holistically as part of the surrounding environment. Jefferson did not intend for students to take a quick look and then dart inside. Rather, day after day, students should observe the ever-changing perspective and be inspired. Jefferson hoped the University of Virginia would help cure the country of low-grade architecture. Architecture, it can be said, was one of Jefferson’s passions—or obsessions. For more than 50 years he put up and pulled down and remodeled his hilltop home, Monticello, overlooking the University. He owned one of the largest architectural libraries in the young republic, and he designed many other buildings for himself, such as Poplar Forest, along with houses for friends, courthouses and the Virginia State Capitol in Richmond. He was intimately involved in the creation of Washington, D.C. For Jefferson and many of the other Founding Fathers, architecture made a statement about not just the occupants of a structure, but also the level of civilization in a country. And a university should be at the very top. Jefferson hoped the University of Virginia would help cure the country of low-grade architecture. The University would demonstrate to students the very best, and from it they would learn to appreciate good taste and take it elsewhere. You can see his pedagogical intent in the 1817 letters he wrote to his architectural comrades, Dr. William Thornton and Benjamin Henry Latrobe. In them, he asked for some suggestions for the fronts of the different pavilions on the Lawn, specifying they should be in “a variety of appearance, no two alike, so to serve as specimens for the architectural lectures.” Jefferson did not envision a school of architecture (the first in the U.S. was at the Massachusetts Institute of Technology in 1865; UVA’s dates to 1919), but expected that students would have talks about architecture and that the Lawn would serve as a learning tool. To create a learning environment, Jefferson departed from one of classical architecture’s essential rules: symmetry, that sides must balance with absolute equality. 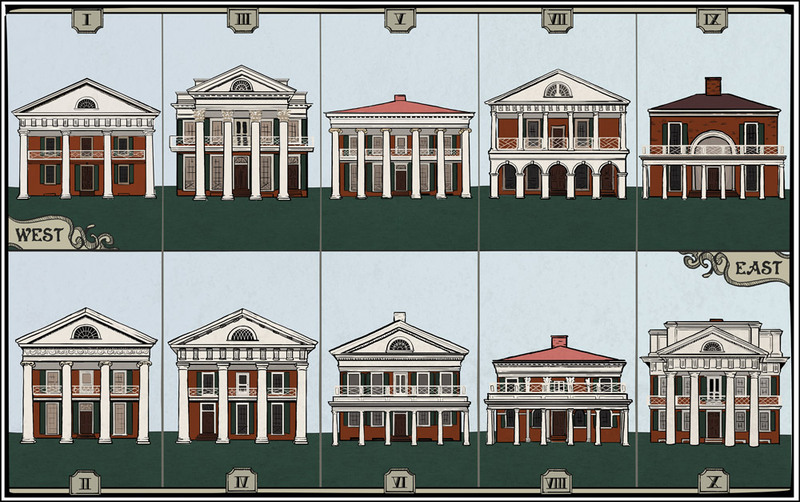 He broke this rule with his facades, “no two alike,” and created a very different rhythm—the Doric order of Pavilion I directly opposing the Ionic of Pavilion II. This continues down the Lawn, with counterpoints on each side, culminating with Pavilion IX, which has a recessed niche fronted by the low row of Tuscan columns, standing opposite Pavilion X’s gigantic Doric order with a pediment and an attic. Jefferson’s intentions for the buildings on the Lawn were very clear: They would teach by example. From the representation of the different columnar orders, the diversity of facades and the geometry of the Rotunda, students would absorb principles of architecture and, Jefferson hoped, gain a sense of design, order and beauty they could carry beyond the University. Richard Guy Wilson is UVA’s Commonwealth Professor of Architectural History.